The Bay of Kotor (Boka Kotorska), 28km long and surrounded by two massifs of the Dinaric Alps (the Orjen and the Lovcen), is definitely the most amazing bay of the Adriatic Sea we’ve seen. The history of inhabitants of the bay goes back to antiquity. The most popular places among tourists are the well preserved medieval towns of Kotor, Tivat, Perast and Herceg Novi. For a place to stay we decided to book an apartment in Dobrota, a small village on the east side of the bay close to the town of Kotor. It was really a great alternative to touristic Kotor. It was much cheaper, plus we had a private beach, which we had most of the time basically just for us. If you are looking for a splendid nightlife and you aren’t coming in the high season, you should probably stay in Kotor. But if you don’t mind evening walks around the bay enjoying the voices only of your loved ones and rarely passing locals, you should definitely pick Dobrota (There are probably many other small cozy places in Boka. If you find any worth recommending, let us know, we’ll check them next time 😉 ). 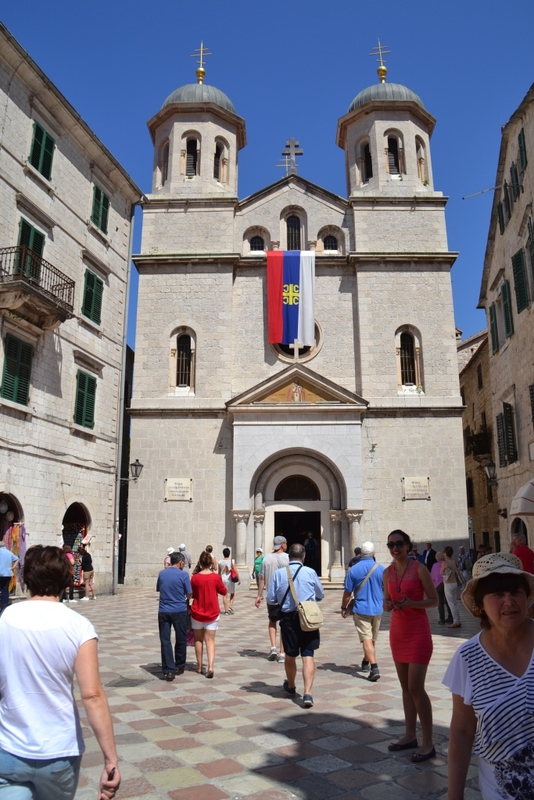 We entered the Old Town through the Sea Gate (Morska vrata) – main town gate. Here you find an inscription with Kotor’s liberation date and Tito’s aphorism: “Tuđe nećemo, svoje ne damo.” (“What belongs to others, we don’t want; what is ours, we won’t surrender.”) And though it was often used as a political slogan during the communist times, it is still up-to-date. The bravery and honor are one of the most valued features among people living here. 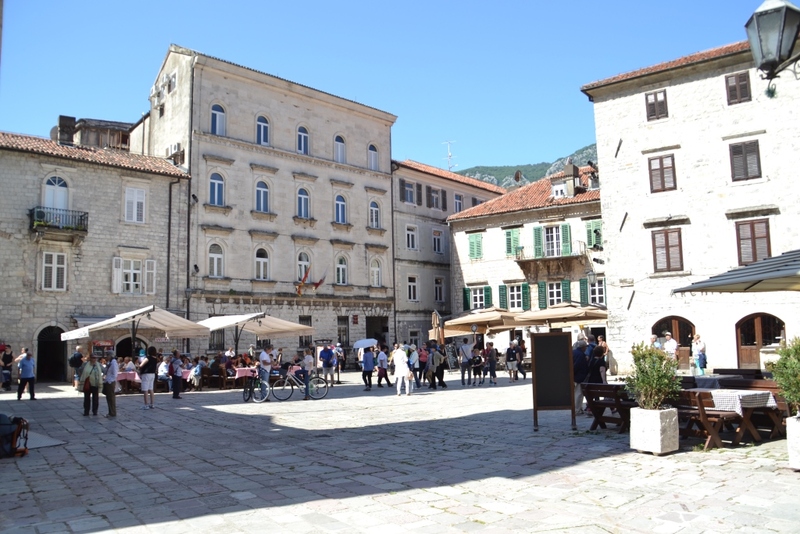 The Arms Square (Trg od Oružja) is the main square in Kotors Old Town. It is located just behind the Sea Gate. Here you can find Rector’s Palace, the Old Town Hall and the seventeenth-century clocktower. Most organized tourist tours start from here. If you’d rather visit the town on your own, there is a tourist information at the Sea Gate (before you enter the Old Town), where you can get maps in different languages. As all Montenegrins, the stuff was really friendly. When they found out that Zosia loves maps, she got one more just for herself to mamble (the word we invented, which means first turning in all directions hundreds of times, making sounds like: “a dididi” and finally chewing 😀 ). We didn’t really make any particular viewing order. We just picked whichever street we found tempting and let the town guide us on its own. Kotor’s Old Town is one of the most fascinating place when it comes to the variety of churches it has. Roman Catholic, Serbian Orthodox, Montenegrin Orthodox and Protestant churches seem to coexist peacefully on this small place. You can find a church at any corner and each street is leading you to a new church. You will find big churches on a square as well as small ones squeezed between houses and souvenir shops. The ones you’ll probably never miss are Church of St. Nicholas and St Tryphon’s Cathedral; their size and location make them pretty easy to find. (Serbian) Orthodox Church of St. Nicholas is situated on Trg Sv Luka. It was built in 1909 in Serbian-Byzantine style. There is a collection of icons and beautiful iconostasis worth seeing. But the most charming church we visited was a small Orthodox church close to St. Nicholas – Church of St. Luke. The church, built in 1195, is one of the oldest churches in Kotor. It was at the beginning a catholic church and only then it was handed over to the Orthodox inhabitants of Kotor. That is why the church combines the elements of Roman and Byzantine architecture. It is as well significant because it has two altars, a Catholic and an Orthodox one. On the floor there are tombstones of joined graves of citizens of Kotor, as burials were held in the church till the 1830’s. St Tryphon’s Cathedral is a Roman Catholic cathedral built in 1166. It suffered serious damages during two earthquakes but was luckily beautifully reconstructed. St Tryphon’s Cathedral is the largest building in Kotor and it is worth to visit it not only for the relicts of St. Tryphon – the patron of the city – but as well for beautiful frescos from 14th century. The cathedral is situated on Trg Sv Tripuna, you can easily find it if you turn left after entering the Old Town. To get a perspective on the Old Town take a walk along the old fortress walls. You enter the stairs behind the Church of St Maria (Trg od Drva), where you pay the entrance fee. During the walk you pass the Church of Our Lady of Health, Little Fortress, and St Ivan’s Castle. On the top awaits you a breath taking view of the Old Town and the bay. If you are visiting Kotor during a sunny, hot day, it is better to take a tour in the morning or in the late afternoon when the heat is not that high. Don’t forget to take something to drink with you, unless you want to buy overpriced drinks on the top. In front of the Old Town walls there is a very nice green market. You can get there fresh fruit, vegetables, fish and other sea food, as well as flowers. It gives as well a great opportunity to observe everyday life of Montenegrins. Our daughter got the attention of most of the locals, everyone smiled to her and said: “mala bebe” 🙂 And with all the flowers, colorful fruit and vegetables it was a real paradise for her.